A timeless two-way bookshelf speaker with a 5.25” woofer, the P5 in the new Alpha Series allows you to transform your system with pristine sound. Featuring a refined bass reflex cabinet and port tube first developed for the original Alpha speaker, the Alpha P5 creates a pure and natural soundstage by utilizing the latest and most advanced driver technologies and magnet structures. The P5 was perfectly tuned inside the anechoic chamber of Canada’s acoustic research facilities to produce a perfectly flat frequency response that lets you enjoy the subtleties of your music and movies with lifelike detail. The P5 uses a 0.75” black anodized aluminium dome tweeter to extend the high-frequency response further than any Alpha ever before while lowering distortion to deliver layered sound with detail and clarity. Unlike lesser designs at this price, all the new Alpha Series tweeters employ ferrofluid cooling to prevent dynamic compression and a neodymium magnet for high sensitivity. The tweeter’s front waveguide and its unique placement below the woofer work together to smooth the response at the crossover and perfect on and off-axis performance. 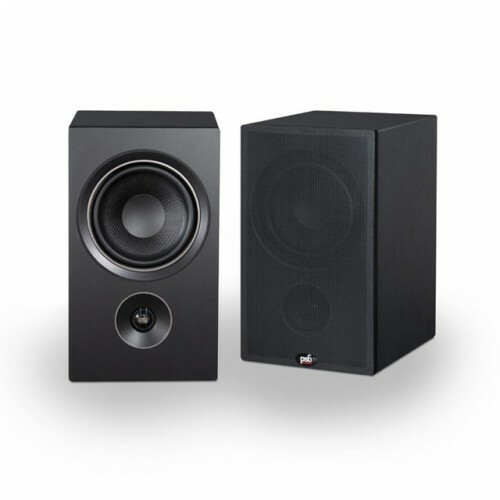 When paired with the Alpha Series’ newly designed tweeter, the P5’s custom 5.25” woofer provides remarkable low-frequency response and the highest speaker efficiency in its class. The woofer is constructed from a special textured polypropylene compound that minimizes cone breakup and lowers distortion at full excursion. It’s also supported with dual layer voice coils and a bass reflex design that uses the rear-firing port tube to control the bass response down to room-shaking levels. The Alpha Series’ new crossover exceeds speaker standards with a special custom design that does more than direct low and high frequencies to the individual drivers--it delivers the tightest control and the flattest frequency response. An unusually complex acoustic Butterworth low-pass filter has also been incorporated into the crossover design to lower distortion and create a seamless soundscape in any type of two-channel setup or surround sound system. A unique combination of wall thickness and bracing controls resonances and provides a perfect platform for the P5’s driver components, while its internal damping material is from PSB’s flagship lines and has been positioned precisely for optimal effectiveness. Finished with a high-quality wood grain vinyl and magnetically attached grilles that are acoustically transparent, the P5 is perfectly designed to seamlessly disappear into any décor and provide rich, detailed sound. CONSTRUCTION Cabinet Sleeve Baffle Front Baffle Rear Grille Face Frame Threaded Insert 1/2” (12mm) MDF 1” (25.4mm) MDF 1/2” (12mm) MDF Black Steel Micro Perf with Magnetic Attachment 1/4” - 20 Threaded Insert (Gross Dimensions) *Non-metric measurements are approximate.